This robot boat was originally built for a Thai art contest, for the 2006 Loy Krathong celebration. An art contest? A Loy what what? Thai?!? Ok let me explain . 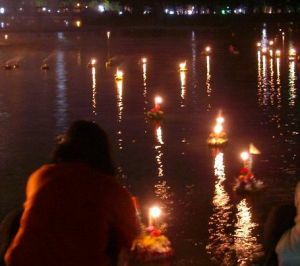 . .
Loy Krathong is the second most popular Thai holiday of the year, right behind the Songkran festival - the country wide all day long waterfight . . . So Loy Krathong, pronounced Loy Gratawng, is when Thai people get to make little pretty floating things out of banana leaves or whatever and place a candle on it. They then Loy (float) the Krathong (the floating thing) out onto the river. There are lots of stories behind it . . . But basically if your Krathong floats down the river past where the eye can see, and the candle doesnt go out, then you and your girlfriend/boyfriend will live together forever in happiness. Thai version of Valentines Day, I guess. Now that you understand why my boat looks so odd, here is the video . . .
And now for the important stuff . . . There are several important things you must consider when building a robot boat. There are weight issues, balance issues, hydrodynamics, waterproofing, the actuator, and sensing problems. There are many different designs you can do, so I will just go over what I did and what I learned and hope you can apply it to your own project. Weight is important when loading your robot boat with various equipment. It needs motors, batteries, sensors, controllers, it all adds up. If the weight is too much, the boat will sink dangerously low - or at least add a lot of drag to its movement. Fortunately, this is an easy calculation to do. First add up the weight of all components for the entire boat, including the hull. Then estimate the desired length and width of your boat hull. * Note that my hull was very close to a rectangular cube, so if your hull has a different shape, use the average hull width expected to go underwater. You want the sinking depth of your boat to be as minimal as possible, but yet deep enough the actuators can go into the water. If you are making a robot sub, then you want the sinking depth to equal the height of the sub to obtain neutral bouyancy. Density of water is about 62 lbs/foot, and in salt water about 64 lbs/foot. The rule of thumb is to imitate the shapes of actual boats, as they have been well tested by real engineers. 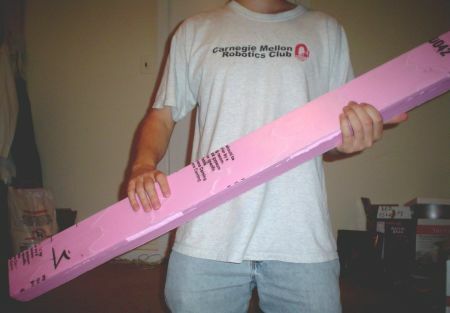 The hull of my boat was built out of a block of pink foam core, typically used for home insulation, and available super cheap at any local Home Depot. I found mine in a scrap pile in the back, but they sell door size blocks for under $15. To cut the foam core I used a bandsaw, and then smoothed the hull down with fine grain sandpaper. Flat Bottom Hull - Easiest to make and low water resistance. Wobbles a lot in waves. Examples of flat bottom boats might be Jon boats, small utility boats, and some high--speed runabouts. Vee Bottom Hull - Very little wobble in waves, but more water resistance. Many runabouts use the vee-bottom design. Round Bottom Hull - Works well at slow speeds, but requires a keel/stabilizer. Many trawlers, canoes and sailboats have round bottoms. Multi-Hull - The most stable of all designs, but also the most complicated. Catamarans, trimarans, pontoon boats and some houseboats carry the multi-hull design. The wide stance provides greater stability. The bottom of my hull was completely flat, as making other shaped hulls can cause complications. Things to keep in mind when choosing a hull is balance (top heavy = bad), turning speed, resistance against bobbing in waves and blowing over in wind, and manufacturability (complex shapes could be more effort than they are worth). I would say my flat bottom design worked well, but was not stable enough in strong winds. The Royal Thai Barges use human paddlers for actuation, but that wasnt possible for the robot so I need another method. To keep it simple and remain as true as possible to how it should look, I chose the paddle wheel. Despite not even remotely attempting to optimize the paddle wheel, it performed incredibly well. I wanted to quickly make the boat remote control for the competition, so this required me to use servos (learn how to waterproof a servo). Higher speed DC motors would probably work better, but I was looking for something quick and simple. Unlike propellor driven boats, this type of actuation allows for the use of the most simplest robot control algorithm - differential steering. Propellor driven boats are designed for speed and efficiency, but they dont perform so well in maneuverability. They also pose significant control algorithm challenges. Even more important, a paddle wheel boat can do 360's without ever moving forward. 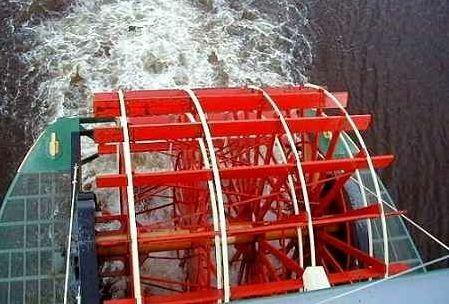 Just to emphasize once more, my paddle wheel design is not optimal and was based on artistic value over functionality. If you were to do a paddle wheel design, I suggest you based the design off a river boat paddle wheel, and place one wheel on each side of the boat as I did. The robot boat was based off of a simple remote control design, using a 6V NiMH 1800mAh battery, a reciever, and two HS-311 servos. I had additional plans to attach a scanning Sharp IR rangefinder with an additional servo for obstacle avoidance, a digital compass for directional navigation, and a microcontroller for control. Note that a digital compass works very well on open water, as there is nothing to disturb the magnetic field near the boat. But after doing initial tests in a lake, I found that it had serious trouble going against strong winds. I was also not willing to go through the trouble to put a GPS on it for localization. Although I didnt do autonomous control, I would have put a backup remote control system on, so I can switch it on whenever the autonomous robot boat got stuck somewhere I didnt want to swim to . . .
See that white square thing under the electronics? I used a 1/8" sheet of HDPE to screw mount my servos in place, and then velcroed the sheet to the unpainted foam core surface. The reciever and battery was velcroed in the same manner. I did a quick design in CAD to make sure everything fit just right. You may download the Thai Boat DWF here.